I am taking part in the Sew, Mama, Sew! Blog May Giveway. To enter for a chance to win my offering you must leave a comment on this post by May 31, 2009. Make sure your comment includes a way to contact you in the event that you win. I will be using a random number generator to select a winner. 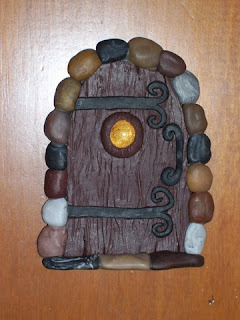 I am giving away this fairy door made of polymer clay. It's a great whimsical accent for any home and is tiny enough to go just about anywhere. The door is 3" x 4", has a recessed wire hanger and can be hung from a small nail. It features rustic wood with iron looking hardware and a glittery golden window. The door is surrounded by faux smooth river stones. It comes with its own scroll bearing my original fairy door legend. Oh what a pretty little fairy door. I would love for them to come and visit me. Is it open to International bloggers? If so, I´d love to have one of this pretty fairy door!!!! What a beautiful door! I would love to use this to add magic into my little one's day! OMG, what a beautiful fairy door. My daughters would love to put this in their fairy garden. Thanks for the opportunity! I would love this for my sister's birthday. She loves fairies. Hm...what an interesting idea! This is so cute. A little door to a fairy world...how cute! Do the fairies know you're giving away their door? My Mom would love this, she has a special gnome tree on her lang in TN this would be perfect for! I have been looking for just such a door for the little sprite that lives at our house best giveaway item yet!! My mother is wild about fairies and their comings and goings. She would adore this door. I think my daughter would LOVE to have this door... she's not yet started making fairy houses, but I think once she gets the idea, she'll have our whole backyard as a fairy land. Please enter me in the drawing! What a pretty fairy door! I've seen these before and I have to admit I have really wanted one! I love fairies and I don't sculpt, so this would be greatly appreciated. Thanks! Wow that is a very cool door! I love this fairy story ! I love it! Thank you for the chance to win and drop by blog to enter my giveaway! Hope to see you there. How cute is that!! My kids would go gaga! Wow! This is so original and so lovely! I'd love to win this fairy door and will keep my fingers crossed, haha! Oh,oh oh, we would love this here! I think I'm drooling over the cuteness!! Oh, my littlest guy would be so tickled to "discover" this door somewhere in our house! ADORABLE! Oh my goodness that is adorable! please enter me in your drawing..
my fairy-loving son and daughter would adore this little fairy door! We are fairy house makers...love the door! I just put in my faerie garden last week, and this would be a nice addition! Ohmigoodness! We make fairy houses but we have to call them micro-dragon houses for my boys. They LOVE to do that and would love that door! wow a fairy door! my little gnomes would love it! thank for your whimsy giveaway! Oh cute! My kids love little things. This is awesome! It'd be great to put in our new house we're building. Thanks for the opportunity! How creative! It would be fun to see when passing by every single time. OH, my daughter (and I) would love this! What a sweet creation! Love the fairy door--it's so tiny and exquisite! My kids would just love it. Thanks so much for including me in your drawing! I'm practically obsessed with faeries so I'd love this! How adorable! Thanks so much for the giveaway! What a darling little door. Please put my name in the drawing. This is really unique - I love it! I love the little hinges on this door. Oh, this would be perfect, as my youngest just got her first wiggly tooth and I was planning to get her a fairy door! This is so neat! I love it and i especially love that you are including the scroll! That wee faerie door is wonderful! I have a house that backs up to a nature preserve! Surely the wee folk live at my place! Love to offer them a new entrance to their homes! Oh, the fairy door would be hung in my special sewing room. It's so imaginative. And your dad's wood albums are beautiful-I admire woodworkers. This is so wicked cool! I love fairies in my garden, and even have a little fairy house for them to live in! But they could use a door to help them go between their world and mine! we love fairies around here! it would be great to give them a little something to encourage them to stick around. thanks for the opportunity! This door is wonderful... I love it.. You did a great job! My mom has been talking about adding a fairy door to her front door. No joke (visit her at http://www.WeeFolkArt.com). Her gnomes need a way to get in and out freely ;). After going on a fairy walk in Ann Arbor DD has been checking the tree out back hopeing a fairy door would appear. I love fairy doors! I've given them as gifts but have none for ME! So cute! I have the perfect place for it. Thanks for the opportunity to win. I love it! My daughter would love it even more!! Thanks for the offer. My boys would love putting this door on their 'friendly tree' and you know the fairies need a good home. I would love to have this fairy door! Thanks for the chance to win it! That door is just so cute and enchanting! What a lovely idea! I love this!! I love how you can add magic to your everday life with little details like that. :) Thank you for this giveaway. My oldest son has been into fairy house lately! This would be perfect in the backyard of our soon to be new house! OMG, this would be perfect. My 5 y/o is about to lose her first tooth, this would be perfect to put in her room for the Tooth Fairy to enter through. I have been wanting a fairy door for so long! I love it, so adorable! I never thought to make out of clay, I might have to give my hand at that, LOL. Oh, how sweet! My little girl would love the little fairy door. Please count me in! That door is adorable! I would love to win your drawing! Such a creative and imaginative idea, Da'Gorgeouses would love one of these in their room! Neat! We don't let the girls play with the 'princesses' at our house- we are fairy people all the way. Thank you for your kindness and generousity! Perfect! We do not currently have any fairies residing here, and I think it's because they think they are unwelcome. This would be just the right thing to show them our hospitality. That is so awesome! I actually have a tiny mirror that I hang on the wall that matches the fairy door very well. I think they belong together. Thank you for the opportunity to enter! I want a fairy door, you make them so beautifully! Thank you for this original giveaway! Oh wow, how original! this is very, very cute, and I'd love to be entered for the draw! I love the door and would definitely hang it! Thanks for the giveaway! Oh it's so cute! I've been looking for few weeks now a fairy or little folks door for my daughter's birthday. We'd love to have it. We have fairies coming around quite frequently. We love them. Awww...what a pretty little thing! Shiny! How sweet - my niece would love this little door for her room or a the front porch, or who knows where LOL Very imaganitive!! Oh! A fairy door - so lovely. My toddler would LOVE this. This is so funny, I think I could find a really great place to put it! THis is adorable. My daughter loves fairies and would enjoy having it in her room. Thank you for including me in your giveaway. I've been looking for one of these for my 130 year old house. It's finally getting painted (for the first time in the town's memory!) and the fairies would be so welcome.